A class lesson on ecosystems inspired a fifth-grade Destination Imagination team from Weller Elementary School into action. The students learned about the devastating effects the introduction of the emerald ash borer has had on Ohio’s forests. Soon after, they organized themselves into the Tree Tribe and held a school-wide November Coin Gobble, raising more than $2,500. They used the funds to purchase and plant 17 trees throughout five different Centerville-Washington Park District parks. The team selected parks located near their school – including Stansel, Waterbury Woods, Weatherstone and Willowbrook Parks. 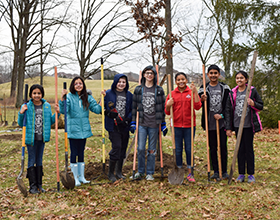 On President’s Day, the students gathered at Rosewood Park to help Centerville-Washington Park District staff plant the final six trees for their project. “We were privileged to work with this awesome group of students. They are a credit to our community,” said Ginger Clark, Community Engagement Coordinator for Centerville-Washington Park District. Destination Imagination is a global educational nonprofit group dedicated to teaching students skills needed to succeed in school, their careers and beyond. They develop project-based learning programs that blend science, technology, engineering and mathematics education with the arts and social entrepreneurship. First identified in Ohio in 2003, the half-inch-long emerald ash borer has managed to devastate Ohio’s forests. The emerald ash borer kills infested trees within three to five years. Because about one in every 10 Ohio trees is an ash, the loss is substantial. The Centerville-Washington Park District has removed over 2,000 dead ash trees from parks for safety reasons, with more trees scheduled for future removal. Weller Elementary’s Tree Tribe members (pictured left to right): Nithya Nunna, Sofia Balwally, Ryan Oxrider, Gabriel Reker, Samaria Williams, Pardhiv Mandava and Heba Fatima.